Is this a wildflower with an inferiority complex? Lovely though its star-like flowers are, Lesser Stitchwort hides its lights under a bushel: they are so often concealed by taller grasses. So deeply are the five petals notched that anyone would be forgiven for concluding that there are ten petals per flower. There are also five pointed green sepals, shorter than the petals but positioned so that they are visible between the white petals. Typically 0.5 to 1 cm in diameter, the flowers are less than half the size of those typical of Greater Stitchwort and they last for just three days, but fortunately new flowers open all through the summer so that Lesser Stitchwort always seems to be doing its best to put on a good display. This pretty wildflower of roadside verges and banks is common and widespread throughout the UK and Ireland. Lesser Stitchwort can be found throughout north western and central Europe, and it is a naturalised (introduced) species in many other parts of the world including North America and Asia including much of the Far East. The white flowers of Lesser Stitchwort are often all but obscured in the grassy slopes and drier meadows that this wildflower tends to favour. In Britain and Ireland the flowers of Lesser Stitchwort first appear in late May but are not plentifuluntil late June. Lesser Stitchwort continues blooming until the end of August and sometimes well in to September. The common name Stitchwort is a reference to a herbal remedy in which the various stitchwort plant were used - allegedly to cure that pain in the side known as 'stitch', which afflicts many people when they try to run after a long layoff from sporting activities. 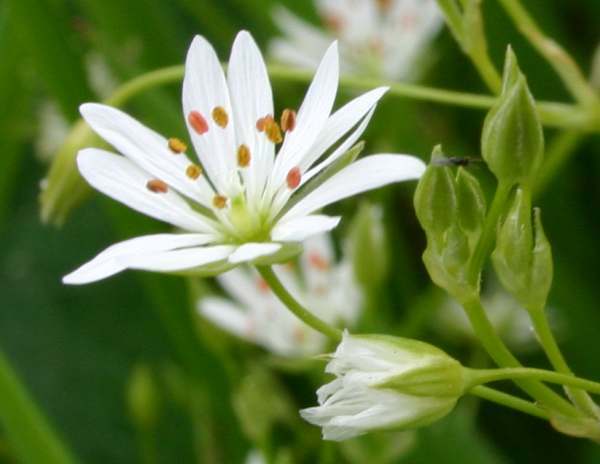 Stellaria, the genus name, means star-like. 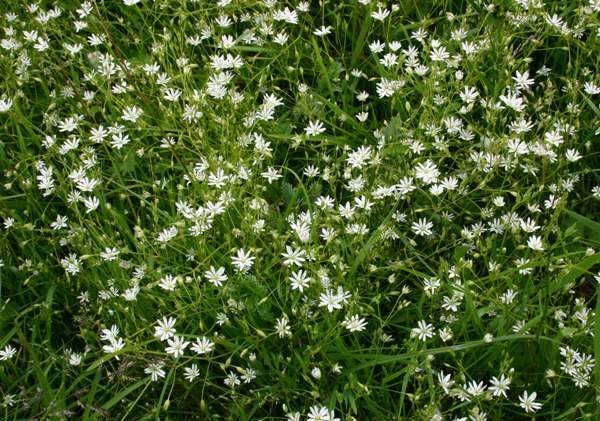 The specific epithet graminea means 'like grass', a reference to the grass-like leaves of stitchwort species. 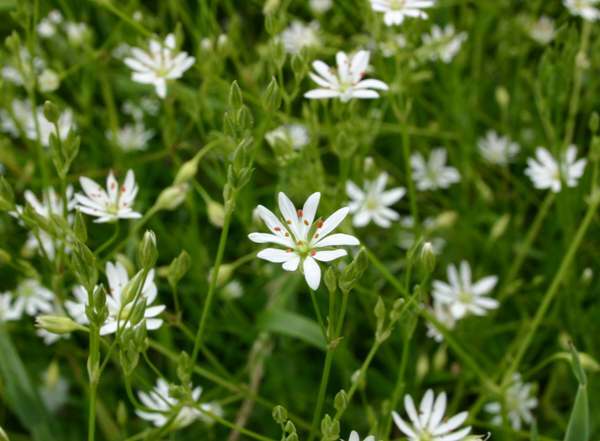 In the USA, where it is an introduced species, Stellaria graminea is commonly referred to as Grass-leaved Stitchwort. Greater Stitchwort Stellaria holostea has much larger flowers and grows mainly in hedgerows and on woodland edges rather than in open grassland. The smooth stems of lesser stitchwortalso help to distinguish it from its larger and earlier-flowering relative Greater Stitchwort. Other related species include the various chickweeds. The plants shown on this page were photographed in West Wales during June.